St Clement stands at the point where medieval and modern Norwich meet. To the south are Fye Bridge, Tombland and the cathedral precincts, while to the north is busy Magdalene street. Westwards stretches Colegate, leading into Coslany, the medieval Norwich-over-the-Water, the industrial heart of the city in the 18th and 19th centuries. Recent planning policies have brought residents back into Coslany, but that was too late for St Clement, which, along with half a dozen other Colegate and Coslany churches, was declared redundant as a result of the Brooke report in the late 1960s. The clock was restored as a war memorial, and looks very fine. Its placing over the bell window is a bit awkward, but at least it provides a landmark, and there isn't another quite like it. St Clement was probably the first of the city churches on the north side of the river, and has lived through the changes that a thousand years have brought. The present church is almost entirely the work of the 15th century, although the chancel is slightly earlier. St Clement's future was secured after redundancy in curious circumstances. 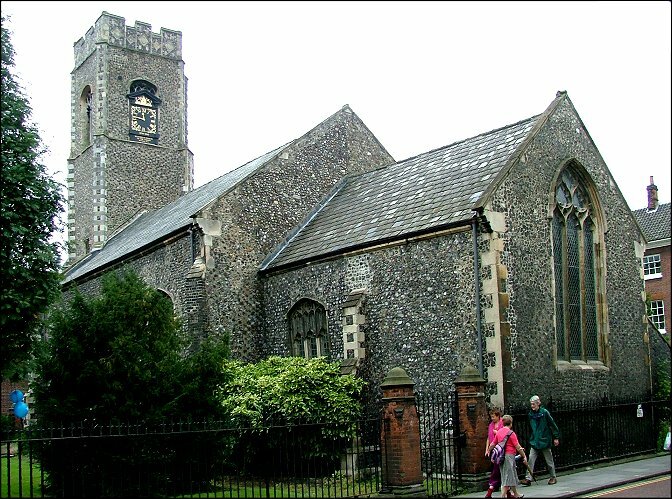 The lease was taken on by Jack Burton, a local Methodist minister, on behalf of the Norwich Transport Workers trade union, partly with the intention of its use as a chapel. Because of this, all the internal furnishings were retained. 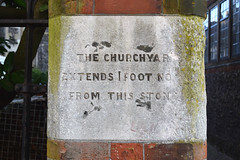 These, dating from the 19th century, were from a time when St Clement's congregation was almost wholly drawn from the local tenements and slums that housed industrial workers, so this was entirely appropriate. 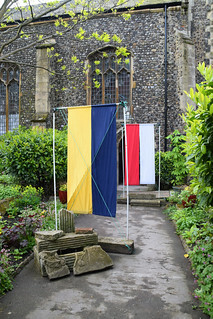 As it turned out, one man's obsession had been a lifeline, and despite a later arson attack, this was for many years the only one of Norwich's redundant churches that was freely open to the public for private prayer every day. However, St Clement Colegate has now found a new, unusual and rather wonderful use. In January 2017, Colin Howey wrote to me: I am the Clerk of a stonemasons' craft guild that has set up a lodge within St Clement Church. We have been based here for around two years and are in the process of training young people serving seven-year terms to become stonemasons. In the final two years of their apprenticeship they will go on their 'journey', working itinerantly abroad, just as their Master did in the early 1980s (we are connected with the German Journeymen and French Compagnons). We currently have nine apprentices training with us and will be recruiting a further forty over the next decade. 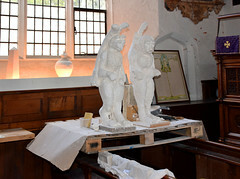 Our Master Mason is a City of London trained mason; an international Guild Master (formerly Master at Windsor Castle, Stoneleigh Abbey etc) and is one of the world's leading craftsmen. His guild - the European Guild of Master Masons - was founded in 1096 and has been in continuous existence ever since (being European in scope they survived intact by moving around when conditions - English Reformation/French Revolution etc - required it). There are only twelve Guild Masters in the world. Upon re-founding a craft guild in Norwich, in recognition of his immense contribution to St Clement, we asked the Reverend Jack Burton to be our Prime Warden - a request he duly accepted. Being a guild in livery we undertake quarterly processions and perform our Mystery Play - Cain and Abel - in the city during Corpus Christi. 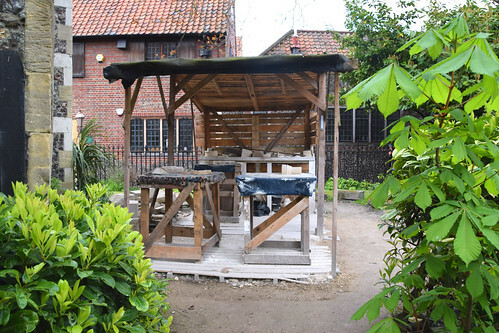 We also have an Artist in Residence working with us and a guild storyteller - the 'Gleeman'. Coming back in May 2017, I stepped through the stonemasons' yard, past guild banners, into the church through the south porch. It was a good twelve years since my last visit, but it was clear that the interior had undergone a great transformation. 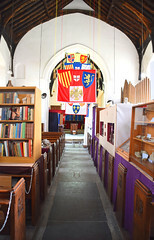 The church is full of colour, guild banners hanging from the roof and around the walls. 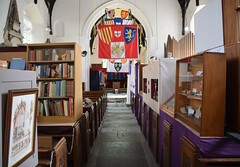 The west end of the nave has become the masons' study area, arrayed with display cases showing examples of different stones and techniques, as well as stacks of books. Beyond to the east is a design working area. 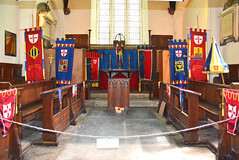 The chancel is maintained as the guild chapel. 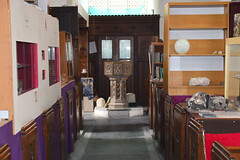 The furnishings and font remain in situ. 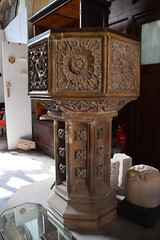 The font is an early 16th century one, with that proto-renaissance styling that makes us wonder how artistic endeavour might have flowered if the Reformation had not intervened. There is also a 1516 figure brass to Margaret Petwood in the middle of the nave, and these two features may indicate the date at which the church was finished. Lady Margaret stands with a large rosary belt wrapped around her middle, a declaration of theological intent in those days immediately before the protestant reformation. A curiosity is that her brass appears to be inlaid with a slightly different coloured latten. Was it repaired at some point, or was that the original intended effect? There are 18th and 19th century memorials around the walls to the Ives and Harvey families, who supplied a number of mayors of Norwich. Despite the change in use, there is still a sense of the church's 19th and early 20th Century integrity. Even the cradle roll survives on the north wall. A number of Norwich's redundant churches have found new uses in the early years of the 21st Century, but I felt that out of all of them this was the one which was at once the most significant and the most sustainable.